You will need 3-4, 1-cup ramekin bowls or a 9-inch pie mold. Heat the oil in a pot, and sauté the onion and red pepper over medium/low heat. Add remaining ingredients and bring to a boil. Once the filling begins to bubble, turn off burner or remove the pot from heat. Portion out the creamy chicken filling in equal amounts among the bouillon bowls or in a large pan if you decide to make 1 large pie. Cut discs from the pie crust so they fit over the bowls and cover the filling. Next, press down the edges of the discs so that the dough sticks to the molds. Make some slices in the surface of the dough, or poke with a fork before placing in the oven. Bake for 15-25 minutes at 375°F. Remove from oven and let rest for 5-10 minutes before eating. The potpies will come out of the oven very hot, so be careful not to burn yourself. Enjoy! I prepared my pies with just one layer of pie crust, the top layer, but you may also make a bottom layer. Try adding mushrooms, 1 medium potato (cubed) and your favorite vegetables. I made individual potpies so they’d be ready to go for the freezer, to be baked at mealtime. 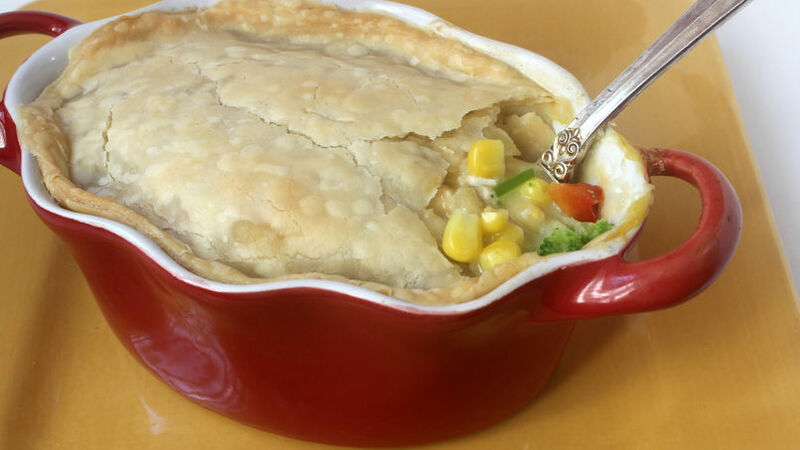 You could also use a large mold to make one potpie. Chicken a la King is one of those dishes that everyone always likes and it’s a solution when you don’t have time to cook. If you live alone and you’re planning on making this recipe for yourself, I assure you this recipe will bail you out more than once so you can eat homemade in no time. Potpies are convenient because you can prepare and freeze then until you’re ready to bake them.